Hawser‘s combat scenes were pretty grueling to write, especially two of them. The 351st Bomb Group, operating out of Polebrook Air Station in the Midlands, started in earnest during the spring of 1943. My August, they were in high gear. All four squadrons flew at least one big mission a week and often more. Many of these missions were to the far reaches of Germany, well beyond the range of friendly fighter protection. Allied air command had the notion that the B-17 could protect itself from enemy fighter attacks, and no amount of evidence to the contrary swayed this opinion. But the first raid on Schweinfurt and Regensburg changed all that. It was supposed to be a showcase for the mighty power of Allied bombers, but with 60% casualty rates and one target left largely intact, they finally realized their tactics needed reevaluation. In 1943, invasion of the European continent was still more than a year away, and the only way for the Allies to attack the enemy was from the air. The British, who had experienced horrific losses during a brief flirtation with daylight bombing, adopted the tactic of night raids. They used firebombs and, since it was dark, destroyed military and civilian targets indiscriminately. Horrific raids on such cities as Hamburg burned tens of thousands of German citizens as they slept in their beds. And Dresden was yet to come. But the Americans, led by General Hap Arnold, held the conviction that it was possible to attack the enemy from the air with minimal collateral damage to surrounding neighborhoods. That meant flying in broad daylight, exposed to enemy fighter and antiaircraft attack with no protection at all. Why they believed this was at first a mixture of arrogance and ignorance. They thought that the British didn’t succeed because they didn’t have the skill necessary to adequately use the B-17 in the way it was designed. They were certain that it was a matter of American know-how. And they refused to see the clear evidence. But the results of Schweinfurt-Regensburg raid were dismal: 55 bombers with 552 crewmen were listed as missing as a result mission. Some of these wound up as POW. 60 aircraft were lost over German-controlled territory, in Switzerland, or ditched at sea, with five crews rescued. Seven aircrew were killed aboard bombers safely returning to base, and 21 wounded. Some of this was due to flukes in weather, timing of diversions and so forth. But it was a wake -up call. Not enough of one, though. The generals in charge reviewed the facts of the case and decided that the reason for the failure was tactics, not strategy. Incredibly, they opted to go back to Schweinfurt a second time. This time it was worse. Much, much worse. It came to be known as Black Thurdsday. You can read about it here. 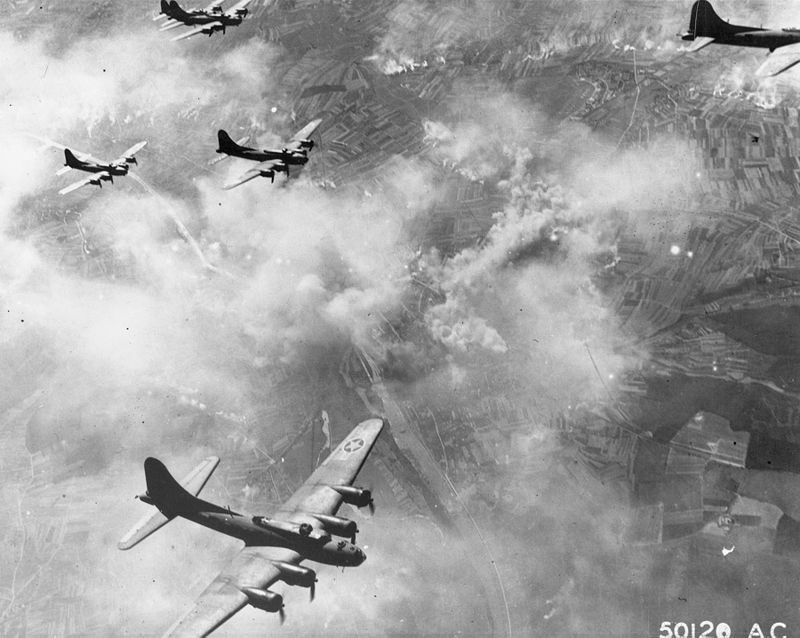 http://www.historynet.com/world-war-ii-eighth-air-force-raid-on-schweinfurt.htm. Or order a copy of Hawser and experience it for yourself!! Posted in B-17 Combat, Schweinfurt raids, WWII and tagged B-17, Might Eighth, Schweinfurt. Bookmark the permalink.